Trucks as long as a swimming pool. Tires, that are larger than a normal sized van. And dumpers, that weigh more than 500 mid-range cars. With machines like that, it even takes 18 steps to reach the driver´s cab. 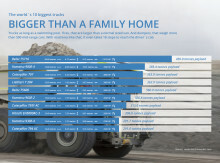 The Top 10 of the world´s strongest trucks is purely beyond our imagination.